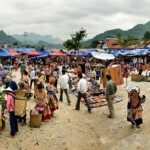 Muong Hum market is well-known as one of the most interesting Sunday market in Lao Cai province and possibly a good alternative trip to Bac Ha market for visitors thanks to the very large variety of the ethnic minority peoples to attend and quite easy to be distinguished through their traditional clothes. 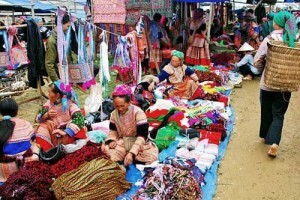 Red H’mong prefer thinner red embroidered patterns on light batik background; In contrast, the Black H’mong in dark indigo with just some decorative motive at the end of the shirt sleeves and round the neck. 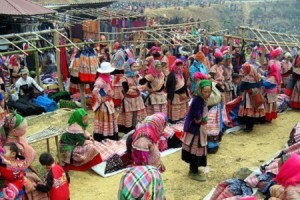 Red Zao and Zao Tuyen wear black trousers and shirts with fine yellow embroidery motifs and pay much attention to the decoration to their headgears including silver chains and bells. 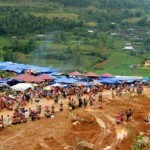 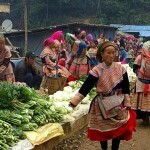 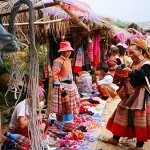 There are also many Zay, Tay and Ha Nhi people joining the market who wear less colorful clothes but no less beautiful.